FASB Accounting Standards Update for Nonprofits – ASU2016-14 – What is the state of your organization’s liquidity, financial performance, and cash flow? These are things that are critical to an organization being able to continue serving its constituents and mission. Savvy donors want to make sure that that their financial contribution is going to an organization that is financially sound and takes stewardship seriously. ASU2016-14 has been issued by the FASB (Financial Accounting Standards Board) to improve nonprofit financial statements by making it easier to assess an organization’s liquidity, financial performance and cash flow. Impediment of preparing the indirect method reconciliation if an NFP chooses to use the direct method of presenting operating cash flows. Is your staff up-to-date on the deadline and changes necessary for compliance? 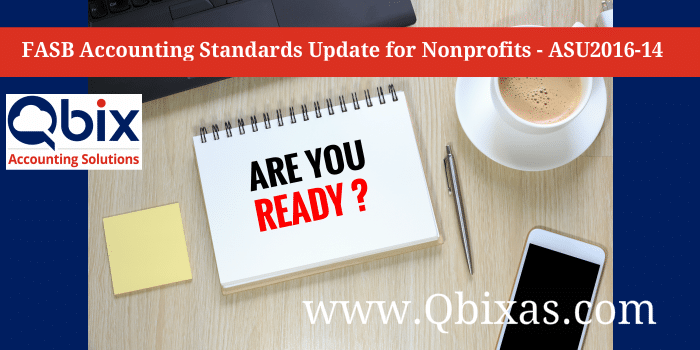 Does your nonprofit software solution accommodate the reporting that will be needed very soon? If your organization is struggling with either accounting staffing issues or nonprofit accounting and reporting, your problems most likely can be solved by outsourcing your accounting to Qbix Accounting Solutions. We are happy to discuss not just approaching deadlines associated with ASU2016-14, but an accounting solution that will simplify and improve your nonprofit accounting with minimum disruption and maximum improvement. You’ll be happy. Your board will be happy. But most important you will be ensuring that your organization will be serving its constituents and community for many, many years to come.